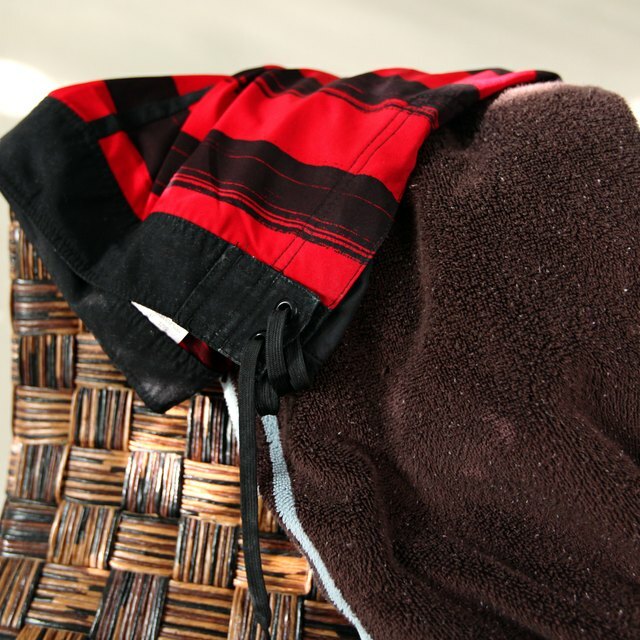 Keep your swimsuit trunks tied tight ,so they stay on properly. Most men's board shorts or swimming trucks come with a simple string. On board shorts, this string is on the outside--sometimes laced up three eyelets like a shoelace--and can be tied into a simple knot or even a bow. Most swimming trunks, however, have the string on the inside. Instead of two strings that can be tied into a bow, the sting for trunks are a long, looped string. If your trunks are too small, tying this string properly, so the trunks stay in place, can be a bit difficult. Pull the looped string up from the inside of the trunks. Hold one hand at the bottom of the string--where the string comes out of the eyelets--this will keep the string pulled tightly out as you tie it. Fold the top loop of the string down and around itself to create a circle. Try and do this as close to the trunks as possible for the best fit. Fold the loop through the circle. With the knot still loosened, you can "slide" it down to the base of the trunks for a tight fit. Pull up on the loop of the string to tighten the knot when it's in place.